TransLink has officially launched into phase two of their UBC/Broadway Rapid Transit Corridor Study. 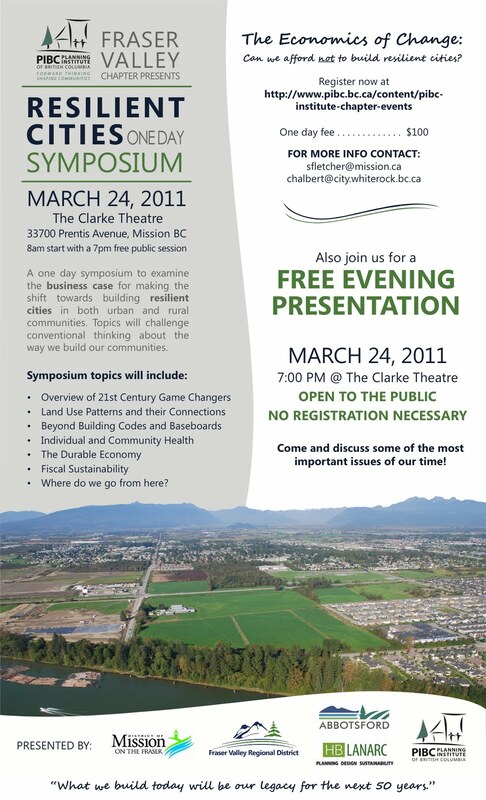 TransLink started the study in the summer of 2009 and expects to have phase two of it complete in early 2012. The UBC study is running in parallel with the Surrey Rapid Transit Study and SFU/SkyTrain Interface Study. In phase one of the study, TransLink looked at some high level corridor and technology options. 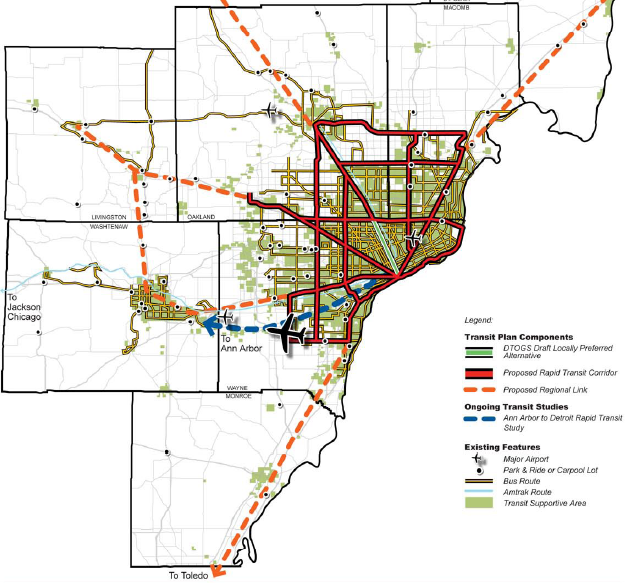 Phase two of the study looks at seven possible rapid transit options. TransLink will be seeking feedback from the general public on the seven options. I’ve outlined the different options, but I highly suggest that you check out TransLink's UBC Study Site. Right now transit service is very unreliable along the Broadway Corridor with trip to UBC taking from 25 to 45 minutes from Commercial/Broadway SkyTrain Station. 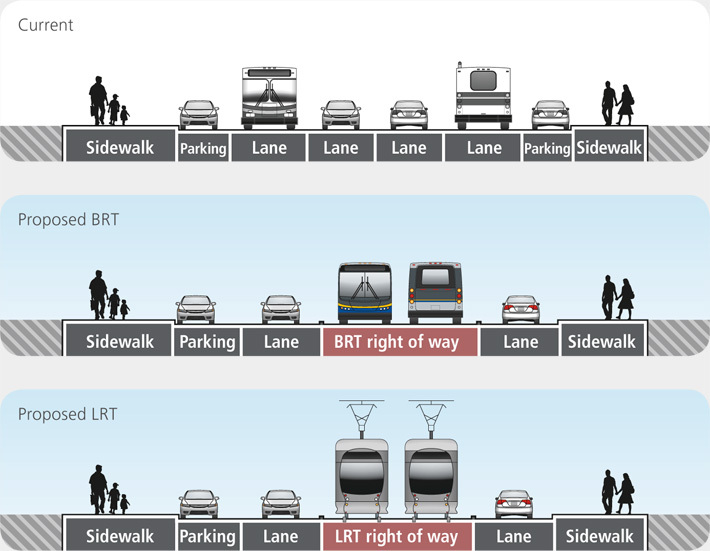 When I look over the different options, it really seems like Bus Rapid Transit is not going to be a good fit for the Broadway corridor and we are likely to be settling on some combination of SkyTrain, light rail, or both. If light rail is picked at the preferred alternative, the stations are being planned without fare gates. This is because fare gates will substantially increase station costs and decrees access. If we are to see fare gates, it will be a political decision. Also, the stations will be designed to handle four-car trains. One of the challenges that TransLink will have to overcome is the issues of parking. 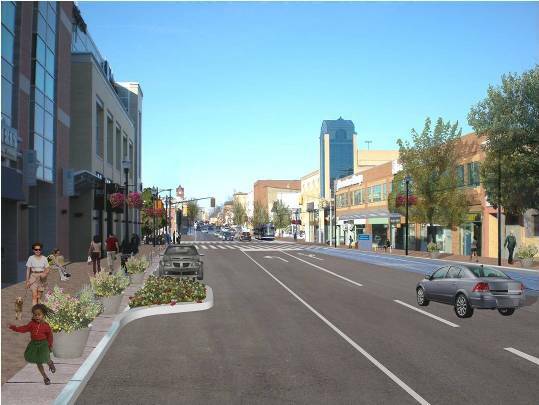 All of the surface-based transit options will require the removal of some parking. Just like in Downtown Vancouver, there will be people who will claim that the world will come to an end with the removal of any parking even though we’ve seen time and time again that this is simply not the case. Check out their website for more dates and for information on their online consultations. Recently I received my New Zealand citizenship and thought I'd do some research about the country. The first thing that I checked out is what the country is doing to fight climate change. While it doesn't take much to beat Canada when it comes to actually doing something about climate change, New Zealand really puts us to shame. They actually have a Ministry of Climate Change! Let compare budgeted spending on the environment per capita for 2010/11. New Zealand outspends Canada by a factor of 3. On the climate action front, New Zealand has an Emissions Trading Scheme to reduce GHG emissions. Also, New Zealand has the goal of a 10% to 20% below 1990 levels by 2020 and a 50% reduction of net greenhouse gases from 1990 levels by 2050. Pretty impressive. Meanwhile Canada's "goal" is to reduce greenhouse gases by 17 per cent from 2005 levels by 2020. Clearly much, much more can be done in Canada. My friend Dan Burden has said many times that bike lanes actually do more for the motoring public than for cyclists. I'ver never had the time to research that statement, but I do trust Dan 100% and value his work very highly. Dan has said that out of the 22 benefits of bike lanes, only two are for the cyclist. 10. Provide for storm water discharge farther from the travel lanes, reducing hydroplaning. 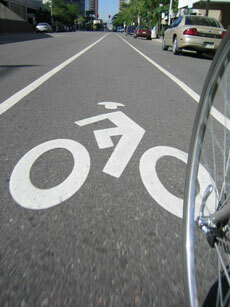 This also reduces splash and spray to following vehicles and nearby pedestrians and bicyclists. 22. Facilitate painting of fog lines. One of the things that I’ve seen in BC in the last decade is a shift from income tax and other hidden taxes to open consumption taxes and user fees. While many people complain about being taxed and feed to death now-a-days, I don’t think they realize that they were already been taxed to death, just more covertly in the past. Any economist worth his weight will tell you that moving to consumption taxes (and fees) are better than skimming people’s pay cheques with income tax. In fact, we haven’t even had income tax in Canada for a century. With consumption based taxes, you can also encourage people to make smarter choices like driving less due to carbon tax and tolling. I cringe when I hear talk from some political parties, both provincially and federally, that want to axe user fees and consumption tax and move back to the bad old days of income tax or deficit spending. While it may appear “free”, you actually end up paying a heaver price now and in the future. With income tax, you are left with less money to save, invest, or do any of the good things that we are told we should do and actually end up being less productive. Government services tend to get bogged down and over-used without user fees because of a lack of proper valuing. We end up with congested roads, burdened water systems, and exhausted infrastructure. All this to say that user fees and consumption taxes are something that will be needed in BC if want our government to be able to invest in all the thing we take for granted everyday and help guide us in making smart environmental and economic choices. CEOs for Cities, an urbanist think tank, released a report called Driven Apart. The report takes a critic look at the Texas Transportation Institute's Urban Mobility Report (UMR). "The secret to reducing the amount of time Americans spend in peak hour traffic has more to do with how we build our cities than how we build our roads." CEOs for Cities notes that the UMR has been used by governments in the US to justify road building projects, but suggests that the UMR is flawed at its core. 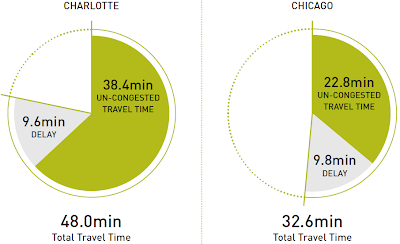 The UMR uses a metric of comparing free-flow travel time to congested travel time. When using this metric regions like Los Angles have the most congestion while places like Nashville rank as some of the least congested regions. CEOs for Cities looks at the total time people spend in traffic and found that places like Nashville have the longest commute times while places like Portland, New York, and Chicago have some of the shortest commute times. Though it seem counter-intuitive, the more congested a cities is, the less time people spend in traffic. Of course built form has a lot to do with reducing travel times. In places like Portland and New York, people have transportation choices, tend to live closer to work, and end up travelling shorter distances. When you look at our region, increasing peak congestion has been used to justify freeway projects like the Port Mann and South Fraser Perimeter Road which ironically end up causing people to travel longer distances and long total times even commute times decreased in our region. 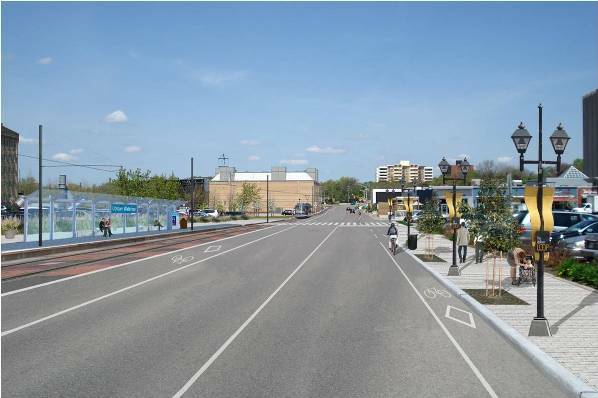 One of the interesting things on the Waterloo Rapid Transit website are mock-ups of what the streetscape will look like with light rail. When you look at the densities in the pictures and that Waterloo region has a population that is similar to Surrey, you can almost see something like this on King George Highway or 104th Avenue. Also interesting is that most of these road going on a lane diet to accommodate light rail. In June 2009, the Region of Waterloo approved light rail as the preferred rapid transit technology to connect Waterloo, Kitchener, and Cambridge which as has a population of 478,121 according to the 2006 census. 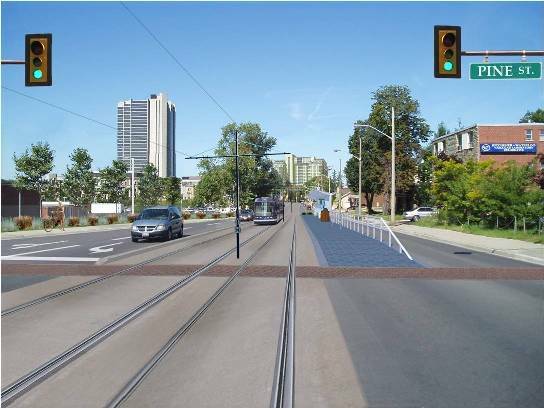 In 2010, the Ontario and Federal governments announced funding for the project though in the fall of 2010 there were some concerns about the cost of light rail as compared to bus rapid transit. Yep, it's the great Bus Rapid Transit/Light Rail debate. Anyway, the staff for the project created a Rapid Transit Implementation Options report which has the following to say about light rail and bus rapid transit. To be clear, the report was talking about Ottawa-style, true BRT not the "BRT" we see in Vancouver or Calgary. It should be noted that full BRT would be very difficult to convert to LRT because of the cost associated with replacing BRT infrastructure before its service life is over, because conversion is not likely to happen until BRT is at capacity, and because it would be very difficult to operate BRT while building LRT in the same passageway. As far as staff are aware, there has never been a conversion of BRT to LRT in the same at-grade passageway. Ottawa will be the first. Ottawa is avoiding some of the problems associated with converting BRT to LRT by planning to build their LRT underground in their downtown area, at very high cost. -LRT has a demonstrable influence on land values and is recognized as a planning tool that can support and encourage the development of more sustainable land use patterns. BRT is cheaper per kilometre to install and to operate than LRT. 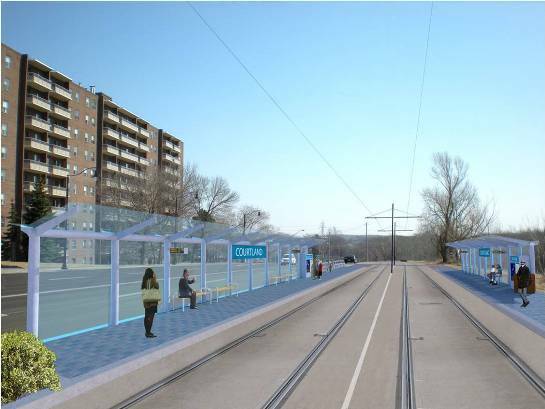 LRT costs approximately twice as much per kilometre as BRT to install. More details about capital and net operating costs are provided in Section 7.4. Operating costs are shown net of fare box revenue. LRT would have higher fare box revenues than BRT given that LRT (Conestoga Mall to Ainslie Terminal) is expected to have higher ridership than BRT. We are very pleased to announce that South Fraser OnTrax has received a $1000 community grant from the City of Langley. We plan on using this funding for a sustainable transportation workshop in the fall with the help of other community organizations. We will be posted more information as we get closer to the workshop. 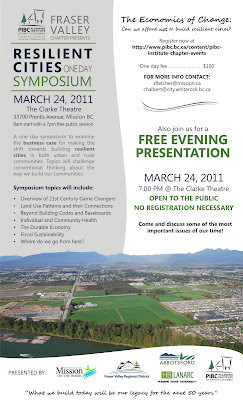 South Fraser OnTrax would like to thank the City Council for support sustainability in Langley. The following is from Streetfilm which is a great site to check out. The first video is on congestion pricing and the second video is about separated bike lanes in New York. The provincial government proposes to improve the operation of the Greater Vancouver highway system over the next decade through the development of four types of programs. High Occupancy Vehicle / Transit Priority Network. It is expected that in the next five to seven years the investment priority for HOV will be the creation of transit lanes and queue jumpers on both provincial and local roads. The objective is to help increase BC Transit ridership by providing time savings and improving reliability. A second priority will be the development of HOV lanes in the eastern half of the Burrard Peninsula to provide connectivity and continuity with the Barnet-Hastings and Highway 1 HOV lanes. The current timetable calls for the completion of a detailed investment plan in early 1998. Major Road Improvements. Over the next two years, the provincial government will co-operate with municipalities to plan regional routes which may be upgraded or developed to take pressure off the Trans-Canada corridor and to improve conditions for local and regional traffic. -Some improvements to Highway 10 in Surrey, Langley and Delta to improve safety and traffic flow between highways 1 and 91. This lead me to another website about the $60 million Trans-Canada Highway HOV lane project between Grandview Highway Interchange and the Cape Horn Interchange. This project completed in 1998, just in time for the $74 million Cape Horn to Port Mann Bridge HOV improvement project. 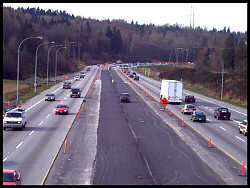 The additional eastbound HOV lane will be an extension of the existing Highway 1 HOV Lanes that opened in October 1998. The HOV lanes currently run from the Grandview Highway Interchange (just east of Boundary Road) to the Cape Horn Interchange (just west of the Port Mann Bridge). It is interesting to note that the HOV lanes were originally for three or more people in a vehicle and was reduced to two or more. 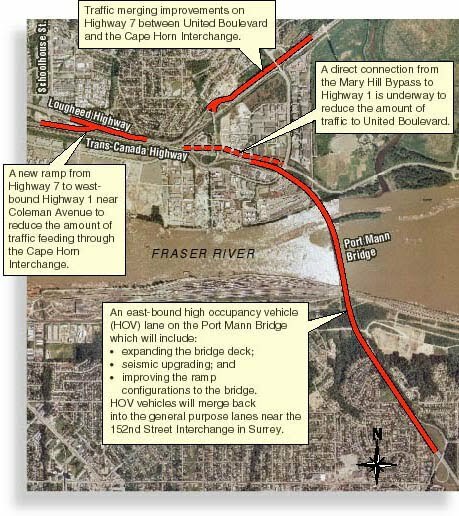 Also really interesting is that the company that is going to tear down the current Port Mann Bridge is the same company that in 2001 complete the HOV lane on that same bridge, Flatiron. Between 1998 and 2001 the government of the day invested $134 million on the Trans-Canada highway, only to have it last for about a decade. Note a very good return on investment if you ask me. 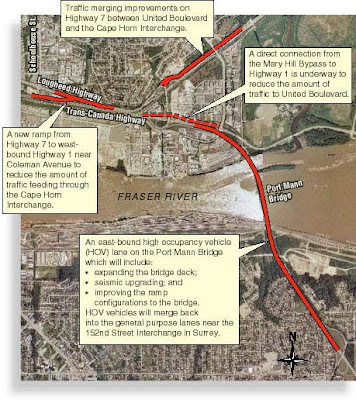 Hopefully, we get more life out of the current $3300 million Port Mann/Highway 1 Project. 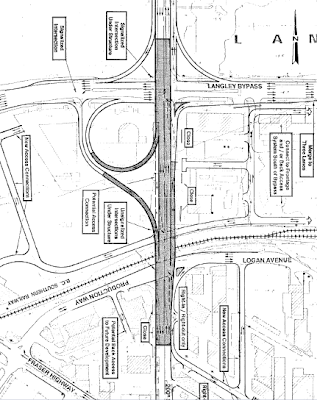 The City of Langley has posted a new 47 page presentation on the 192 St/51 Ave/196 St, $121.00 million Roberts Bank Rail Corridor Program Overpass Project. 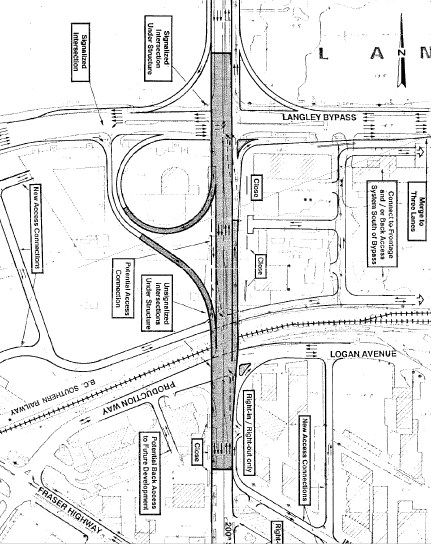 What I found interesting is that on page 27 thought was given to a major interchange at 200th Street and the Langley Bypass. It was costed at over $150 million and was quickly rejected. This goes back to a previous point I've been making on this blog which is that the road network we see is pretty much what we got due to the high cost of plowing roads through viable businesses and residential neighbourhoods. In the South of Fraser we will be ringed by freeways, but we will have to rely on a diverse transportation mix to get us through the increasingly congestion core road network. The tallest building in Langley, the six story Langley Lodge Seniors Care Centre, will complete its three-year expansion program which saw the construction of a new six storey West Tower and the complete renovation of the 1974 East Tower in April. The project cost a total of $28 million. What is interesting about project is that there is no basement or underground parking which I'm sure helped in keep the costs down. As the population ages and the cost of transportation increases, I have to wondering if this will become the new normal for construction. I know that in the City of Vancouver and Surrey, they are experimenting with unbundling parking from apartment purchases. Anyway, the Langley Lodge has a February 2011 and October 2010 Construction Bulletin which has more information on the project. Back in December I was in LA working with Dan Burden on a project. He told me at that time, that he would be doing a talk for TED. Well, it has arrived. Mr. Dan Burden at TEDx Manhattan Beach! Dan has sent along another interesting link from the same TED discussion and I will be posting that on another day. Dan believes this economic crisis is causing America (and probably many other places) to wake up and change the way we are building our communities. Development is not a bad thing. It is how we do development that can be good or bad. Listen and learn from the Master of Walkability as I call him, Mr. Dan Burden. Just for fun, I decided to compare what the City of Vancouver has set aside for cycling infrastructure improvements as compared to South of Fraser municipalities. I must point out that, with the exception of the City of Langley, budget information hasn't been easy to find and requires way to much effort to find. Anyway, in Vancouver they have a three-year, $494.8 million capital budget from 2009 to 2011. In that budget they have set aside $29 million for cycling (Cycling Network, Greenways Program, Burrard Bridge Traffic/Bicycle/Pedestrian Upgrade). On average that's $9.6m per year or $14.94 per person on cycling. The City of Vancouver outspends Surrey by a factor of 3 on cycling which shows that we have much catching up to do in the South of Fraser give that Vancouver is outspending us on cycling and that they had a 20 year head start! In case you missed it, yesterday the City of Surrey broke ground on the new City Hall which is part of the new civic centre in Downtown Surrey. The new City Hall and Community Plaza are part of the Build Surrey program, the most comprehensive construction and capital works program in the city’s history. The program will see a variety of community centres, recreation facilities and infrastructure projects built in every town centre over the next ten years to create vibrant, connected, pedestrian-friendly communities. 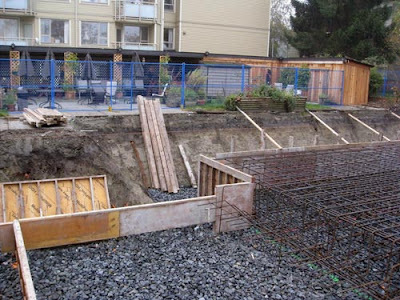 Other Build Surrey projects in City Centre include the new Chuck Bailey Recreation Centre, a new 75,000 square foot regional library currently under construction, a covered youth park, a performing arts centre, as well as walking trails and beautification initiatives. 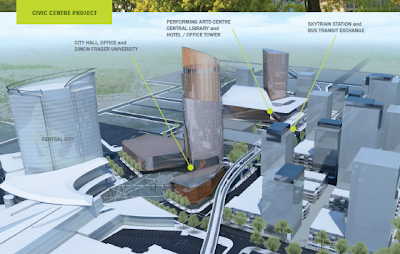 In conjunction with the major new residential developments underway, these projects will support new commercial, entertainment, education, civic, and recreation opportunities for residents and businesses in Surrey. I've been following the progress of a proposed streetcar line in the heart of Detroit for about a year now. Detroit is pretty much a text book example of how 1950's urban planning, white flight, and complete faith in the automotive industry lead to the complete devastation of the core city. Right now 27% of all land parcels in the City of Detroit are vacant and the core city's population continues to shrink. It's not all doom and gloom in Detroit though. While there is certainly some interesting proposals and projects with urban farming in the city, they are also looking to light rail to bring life back. In 2006, planning started for a 9.3 mile starter streetcar line that will form the backbone of a new regional rail transit system. The 3.4 mile first phase is scheduled to start construction this year. They have also posted a video of what Woodward Avenue will look like with light rail. People and business in Detroit have looked at how light rail has trigger investment in other communities and are looking to get on board. Ironically, like most North America cities, Detroit had an extensive streetcar system that was ripped out for the auto including on Woodward Avenue. Even more importantly, it will also play a key role in revitalizing Detroit. As Mayor Bing pointed out in his State of the City address, it is a centerpiece of plans to attract 15,000 new residents to the Midtown area. Businessmen like Dan Gilbert, Roger Penske, and Chris Illitch are so confident in this rail project’s ability to boost downtown Detroit that they are donating their own money to help build it. Rail transit is no longer just for the New Yorks and Chicagos of the world. Cities like St. Louis, Pittsburgh, Dallas, Minneapolis, Denver, Charlotte, Houston, Salt Lake City and Phoenix all have successfully integrated light rail into their city streets. Ridership is well above expectations, with the light rail attracting not only low income workers who need affordable transportation, but also professionals seeking an escape from long time-wasting commutes. And like Dallas, these cities are reaping enormous economic benefits from it.